Eat Right, Move More, Breath Easy at Work! 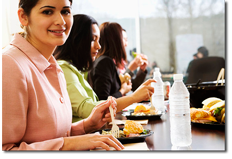 Corporate Dietitian Services and support are offered through Fairfax Dietetics. In addition to meeting individual goals, consider team goals in diet and nutrition for the office place. All across the United States, large and small companies are changing the corporate culture. Many offices provide time to exercise along with education on dieting, weight management and overall healthy lifestyles. The benefits are employees become more productive, reduce their risk of developing chronic disease, and are happier in their home and work environment. Employers are rewarded with lower healthcare expenses and absentee rates resulting in reduced operating costs. Our corporate nutrition programs are geared to providing nutrition education opportunities to your staff and to assist the entire corporation in living healthier lives. Implementing corporate nutritional services has proven a success in many environments and has been mutually beneficial for both the employee and employer. What Services do we offer in our Corporate Nutrition Plans? 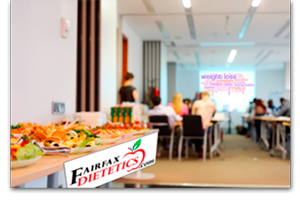 Fairfax Dietetics will work with you in developing and implementing the RIGHT employee plan! Are you ready to get started? To transform your team and your organization? Who is Corporate Dietitian, Deborah Jeffery? 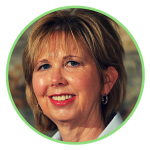 Deborah Jeffery is a Registered Dietitian Nutritionist with over 20 years experience practicing medical nutrition therapy in hospital, private practice and corporate settings. She has developed and implemented corporate weight loss and wellness programs. Deborah is available to available to provide individual health assessments, develop and teach courses, present seminars and write articles for publications. Along with nutrition, she is an experienced trainer on a variety of healthy lifestyle topics including stress management and sleep. Deborah works closely with each client and is willing to collaborate with other health care providers to develop the best program to meet the client's needs and outcomes.